The beauty of architecture is in creating something truly unique and being able to enrich the world with new and personal ideas and projects. While the contribution the architecture makes to the world is enormous and extremely special, each and every one of us has the opportunity to leave our own mark on this world, whatever it is that we do. Not only can we leave something to be remembered by through our careers, but through our very existence, too. We are all the architects of our own lives, and we’re only provided with rough drafts. How we decide to construct and organize them is up to us, the master architects. Architecture is our silent guide through the history of the world. The books and testimonies may lie but the buildings, fortresses, castles, and walls cannot. In architecture, we can read hidden messages, recognize patterns, truly understand periods and people, and witness the chronological development of our civilization, through wars and hardships, as well as glorious times. It is amazing how different styles in architecture can paint the picture of that historical period so vividly and originally. Each and every movement in the architecture portrays the characteristics of that particular period. Therefore, we could perceive architecture as the mirror of time; the patient witness of history. The history of architecture gives us the opportunity to travel through time and learn about different styles, especially when it comes to those that haven’t been preserved, unfortunately. It is truly fascinating to see how architecture developed through time, from pure functionality to a perfect mix of comfort, quality, and aesthetics. People learned to focus not only on the pragmatic aspect but on the beauty of architecture which shapes the world we live in. Also, in the architecture of different periods, we are able to recognize the traces of the routines, lifestyles, and interests of people who lived in that time. 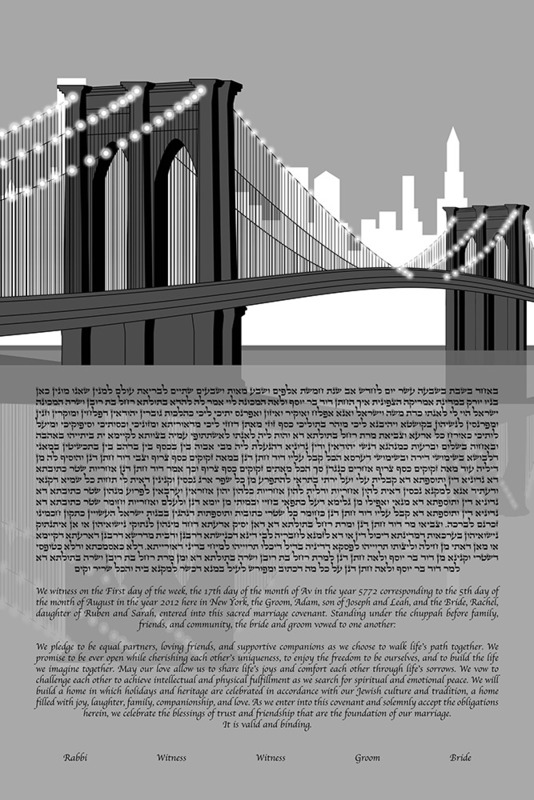 The Brooklyn Bridge BW architecture-inspired ketubah celebrates the architecture pearl of not only New York but the entire world. The black and white design of this architecture-inspired ketubah piece emphasizes the simplicity, elegance, and undeniable chic style of the modern art. This ketubah also incorporates the city skyline in the background, creating a peaceful, serene representation of the city any New Yorker would appreciate. This particular ketubah design, as well as other pieces from our architecture-inspired collection, is a perfect choice for architects or those who simply appreciate the beauty and value of architecture.